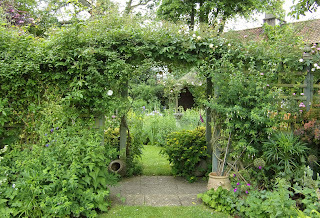 A village about twenty minutes from where we live had their Open Gardens on Sunday, so, as the weather was reasonable and I do enjoy nosing round other people's gardens, off we went. We visited last time they were open, in 2014 and you can see the posts here and here . 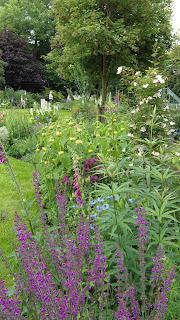 There was a variety of sizes of gardens but all had lots to interest the visitor. Many of them had large borders, which showed the plants off beautifully. This poppy had escaped into the next door field. I liked this arrangement with peonies and delphiniums. 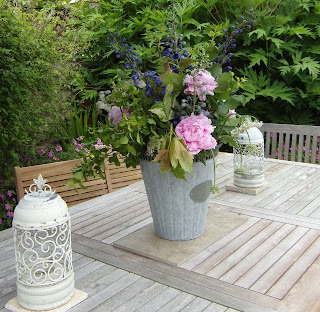 A nice place for a G & T (or cup of tea), depending on your preference. There were small gardens behind a terrace of cottages which were beautifully maintained. The owner of this garden made me laugh. She told me that one of the organisers of the afternoon had sent all the owners badges to wear, but "mine's still in the envelope...I'm not wearing that!" 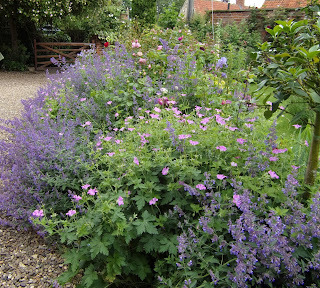 There were roses, lupins and geraniums a-plenty. 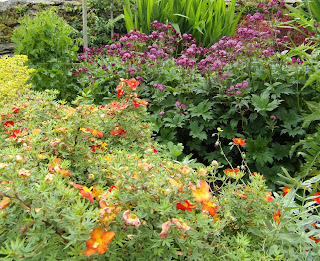 In the next door garden, there was some fiery planting with the orange and red of the potentilla. 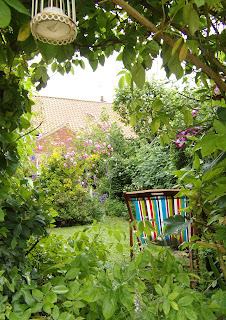 There was a very inviting deck chair in a quiet corner. 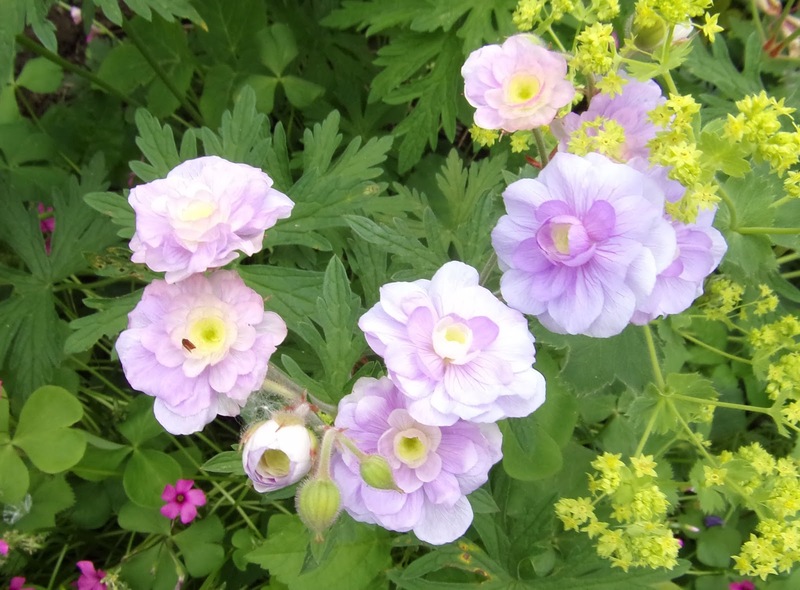 Hardy geraniums were everywhere and this one caught my eye with its gentle apricot and lilac tones. It is a double flower, which meant it wasn't good for wildlife, but it was still very pretty. 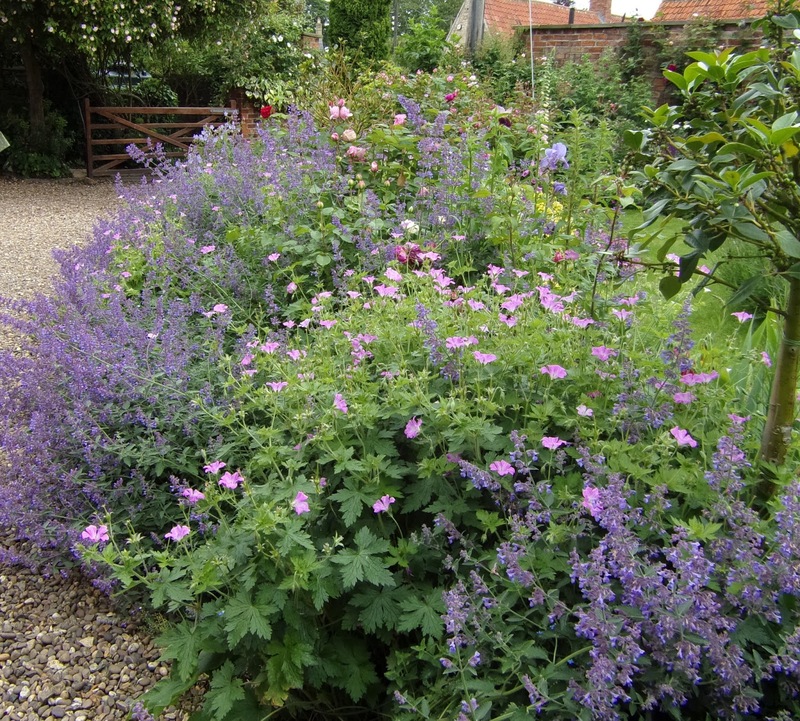 I think it may be Geranium 'Summer Skies'. 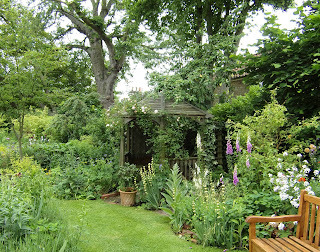 These photos were from my favourite garden, which was very photogenic (and looked very labour intensive). ...as well as some sunny borders with hot colours. 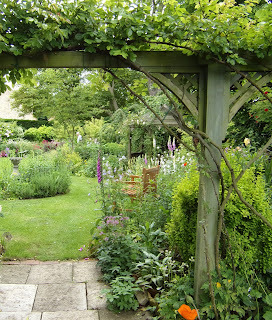 The screens and trellis dividing areas of the garden provided some pretty views. 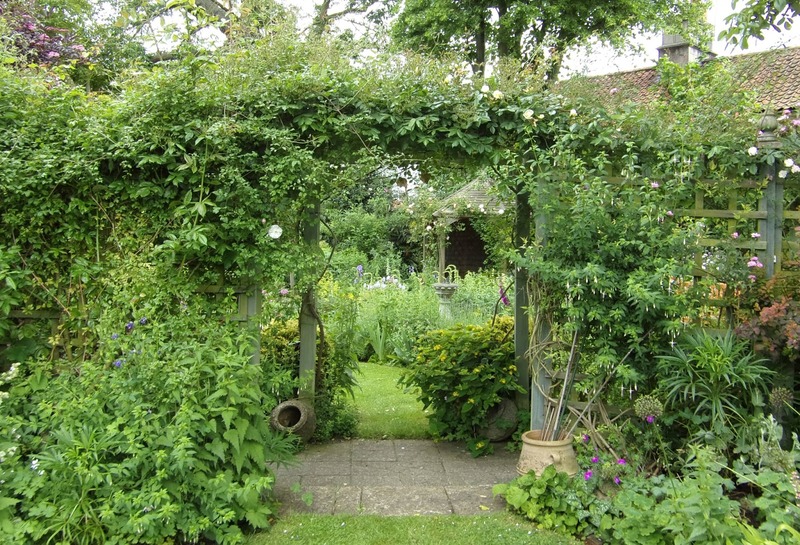 Doesn't this archway make you feel that you want to explore? 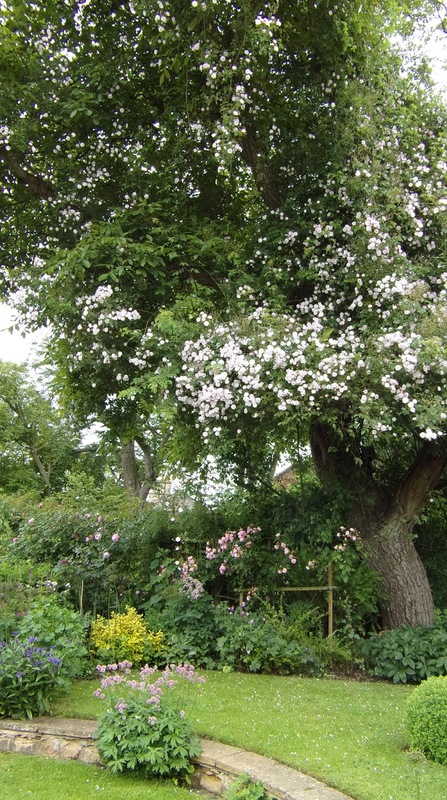 The rose had climbed right to the top of the tree and looked amazing. 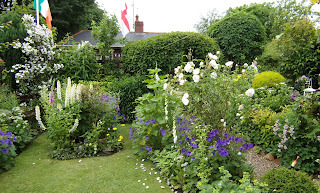 The front garden was full of roses, cat mint and geraniums. Scruffy would have loved the cat mint - it is a good job he wasn't with us! 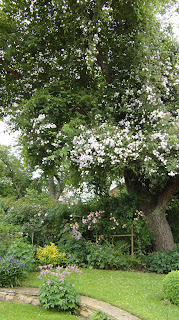 We had a lovely afternoon and enjoyed sandwiches, cake and tea at the Village Hall. A perfect Sunday afternoon. Very beautiful indeed!! 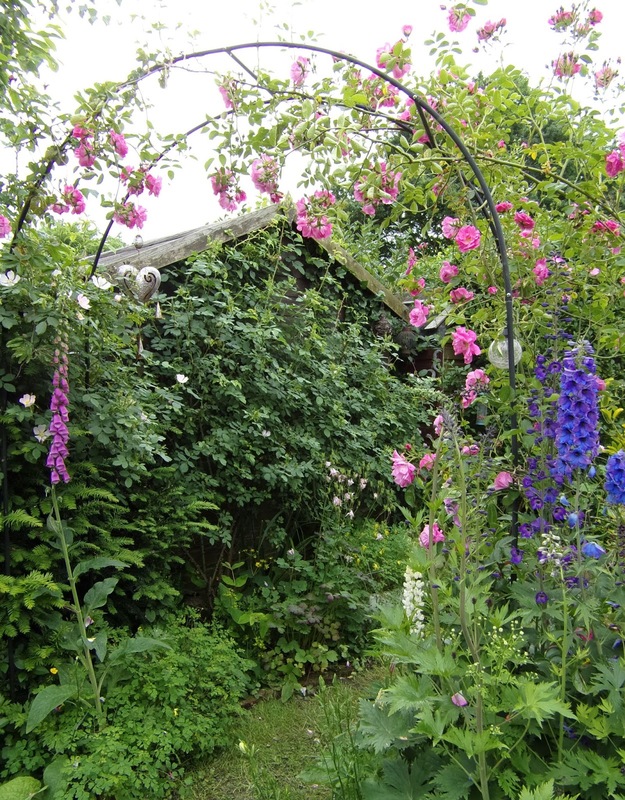 Lots of lovely plants, just as you imagine an English cottage garden to be! Thanks, Amy. I enjoy seeing other people's gardens and what they plant. 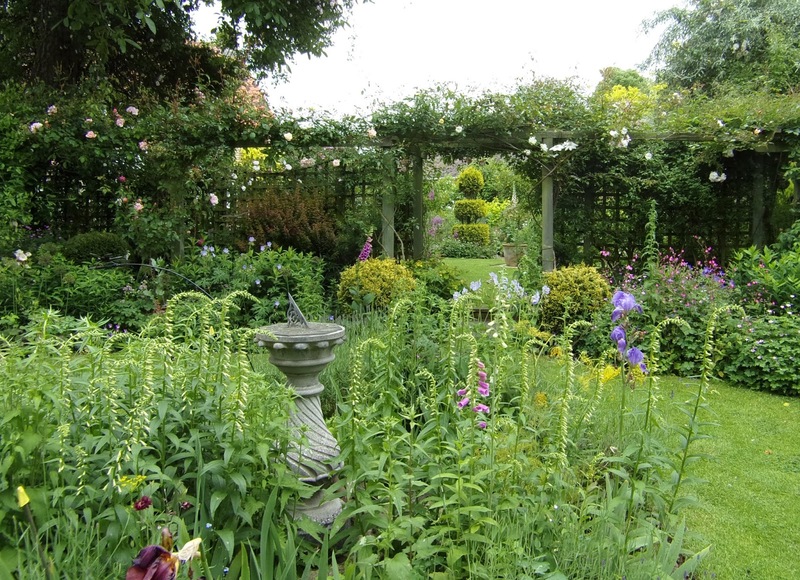 These gardens really did reflect the owners. How absolutely delightful. Arches are so inviting aren't they? And I would have had a very happy time oohing and ahhing at this beauty. And feeling more than a bit inadequate too. Thanks, EC. 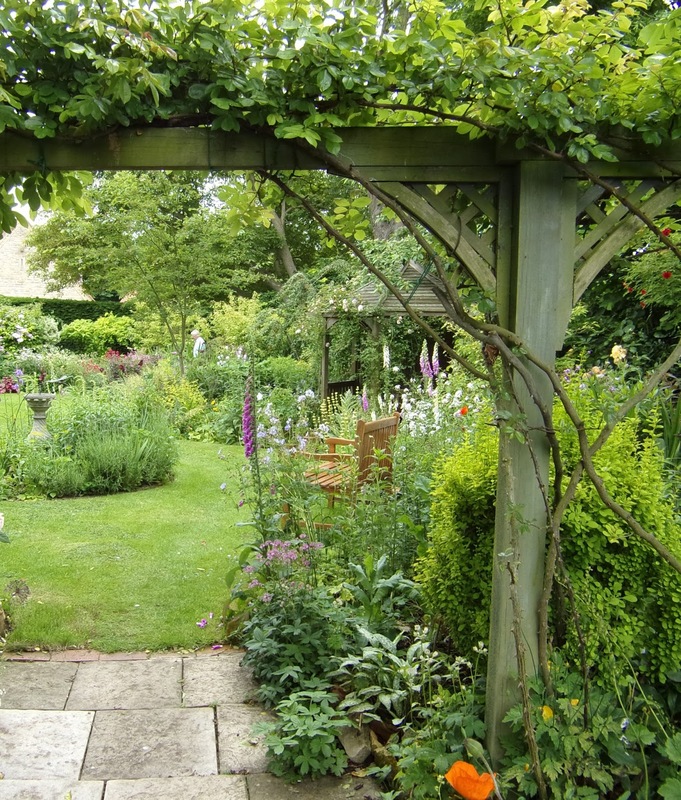 It is one of the joys of summer in the UK to be able to visit other people's gardens. It does make me feel a little despondent on returning home, but on the positive side, I do share a lot of the plants I saw today, albeit in a much smaller space! What a wonderful way to spend your afternoon. This looks just gorgeous! 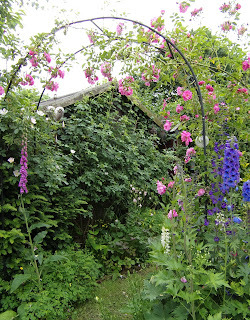 Boy, keeping gardens looking so beautiful must take a tremendous amount of labor and love. Thank you for sharing with us, Ellie. Thanks, Kim. The gardens were lovely and all were well tended and obviously loved by their owners. It was a lovely way to spend a Sunday.